You may think that this pumpkin and spice laden bundt should be baked in the fall where it would fit right in with the other flavors of the season, however, I could not pass up the opportunity to use a HOME GROWN PUMPKIN from my mother’s bountiful garden. See? Isn’t it gorgeous? Who could ignore that baby? I have had it on my counter for a WHOLE WEEK and have toiled over what to do with it. You see I am a pumpkin fanatic and just like there is Shark Week for the Discovery Channel and Fashion Week in New York, there is Pumpkin Week at our house…multiplied by at least four. When October rolls around, I am just chomping at the bit to get on the pumpkin bandwagon and start cranking out muffins, bread, soup, pancakes, cake, cookies and many other goodies that include pumpkin. At first my family reacts with, “YAY, it’s pumpkin season!”, but then somewhere in mid October their enthusiasm has deflated, and it’s like, “Another ! @#* pumpkin pie–bread–muffin!” It’s like that feeling on January 2 and you just can’t look at another snowman in your house for one second longer. Or…is that just me? Oh, how I wish we had smellevision or skype for smells…you could take a whiff of the spice filled citrus scent that is blanketing the air at my house. I am almost getting high on the fabulous aromas coming from my kitchen. Maybe I can help you imagine it. Take a seat on the sofa, and make a little room for the toddler-like Golden Retriever who is prepared to lie across your lap like a toy poodle. The beautiful nutmeg, cinnamon, pumpkin and orange scents are making their way throughout the house, up the stairs and out windows and doors to taunt my neighbors with the possibility that autumn is around the corner when we are really in the throes of a sweltering summer. Then take a bite of this soft, moist pumpkin cake as it drips with the cream cheese glaze. 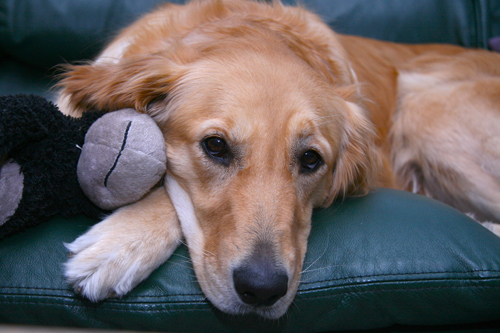 Don’t worry if a crumb or two falls on the sofa…Sadie is there for you…that’s just the kind of loyal dog she is. She’ll happily oblige in licking up the mess. So if you are dreaming of fall or even a white Christmas in this hot and sticky summer season, shake off that “you can’t make gingerbread in August!” kind of thinking and jump right in and make whatever the heck you want…even a pumpkin cake! Cake: Preheat oven to 350 degrees. To prepare the cake, place granulated sugar and butter in a large bowl; beat with a mixer at medium speed until well blended. Add eggs, one egg at a time, beating well after each addition. Beat in Canola oil, orange extract and pumpkin. Lightly spoon flour into dry measuring cups; level with a knife. Combine the flour and next 6 ingredients (flour through nutmeg), stirring well with a whisk. Fold flour mixture into pumpkin mixture and add grated orange zest. Pour batter into sprayed bundt cake pan (10-inch tube pan). Bake at 350 for 55 minutes or until a wooden toothpick comes out clean. Cool in pan 10 minutes on wire rack. Remove from pan; place on rack and cool completely. Glaze: Place the sifted powdered sugar and cream cheese in a bowl of a stand mixer. Beat on medium until well blended. Beat in 1/2 t. vanilla. Add orange juice, 1 tablespoon at a time until it is the desired consistency to drizzle over the cake without running off. 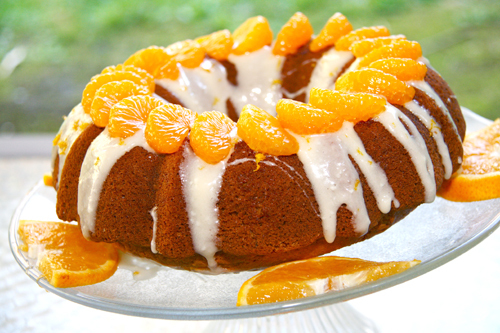 Grate fresh orange zest over the cake and then place Mandarin Oranges on top for garnish. I don’t know if you have ever braved making your own pumpkin puree, but it really isn’t very difficult and the pay off is huge is you have fresh pumpkin sitting around just waiting to be properly utilized. It’s simple…see? The steps are in the recipe below. Just cut off the top portion about an inch or two below the stem and then cut it into large wedges. 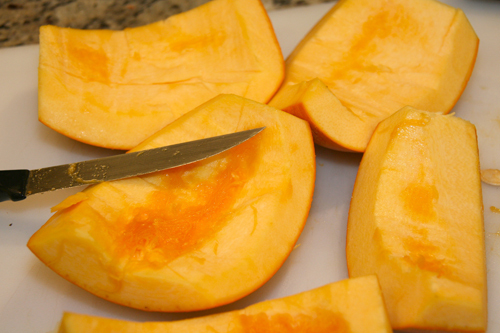 Use a knife to carve out the pulp and the seeds from each wedge, just like you would cut out the seeds of a cantaloupe. Place the wedges flesh side down (rind faces out) on a cookie sheet, cover tightly with aluminum foil and bake at 350 degrees for 40-50 minutes, until it is fork tender. 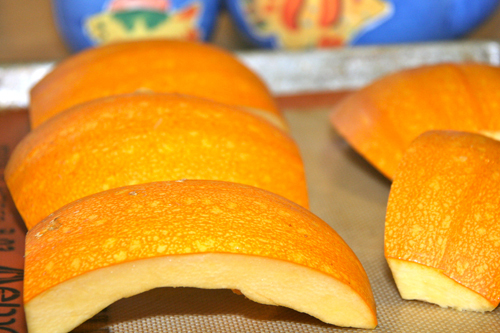 Let it cool until it is easy to handle and carve out the flesh of the pumpkin, leaving behind the rind. The flesh can be put into a food processor and processed on high, pulsing, for about a minute or so, until you have smooth puree. Store in an airtight container in the fridge until you are ready to put it into your recipe. It will freeze for up to two months. I have read that you need to “drain” your puree by letting it sit over a sieve, similar to allowing yogurt to drain, however I have NEVER done this and my recipes were JUST FINE. I like short cuts! I guess if your puree is juicier than usual, you can let it drain, but otherwise go crazy and use it as-is from the Cuisinart. Geni, this looks divine! Yummy yum! 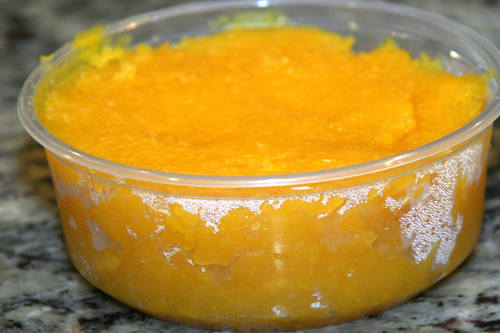 Thanks for showing how to make homemade pumpkin puree also. I’m definitely going to be making my own from now on given how easy it is! 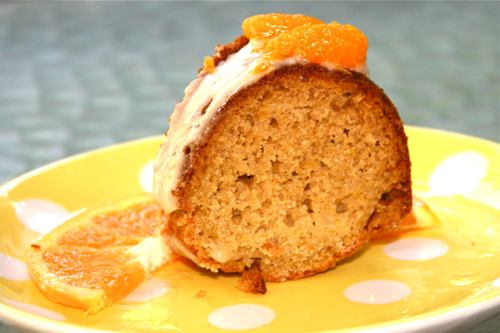 This bundt looks so good, especially with the oranges on the top! Hi, Geni. This is a nice precursor to fall (but did you have to remind us already?!?) 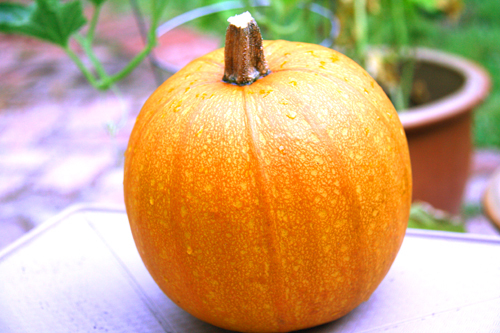 – of course, you don’t have a long slide into wetter, shorter, colder, and greyer days, just when the pumpkins start appearing up here in October. Funny, I never thought about pumpkins being ready in July in SoCal…I learned something new. Your dog is very cute and has colouring which fits in with the spices for pumpkins. Nice orange-yellow theme throughout your engaging post. We are so lucky in So Cal with the abundance of produce we can grow in our own backyard. That is such a cute post title! Although it’s the middle of summer, one can always have pumpkin, cinnamon, and nutmet anytime! Geni, this is wonderful piece of cake…just like you I like pumpkins in every possible way, and all four seasons.. I love your blog, so happy and like you said cheerful! I refuse to make anything pumpkin until, at least September, but Geni, you are tempting me to make this now. I was wondering what new pumpkin recipes, I was going to bake, this year. I have some, I really love that were new, last year. I am printing this up so, if I don’t make it now, it will be in my folder, for September. Thanks for having such delicious recipes. what a great bundt cake….fresh pumpkin, wow, now thats really being serious about your cake, and the cream cheese frosting must have been perfect with it! Those little oranges make a very nice addition to it also! Necessity is the mother of invention…normally I would just use canned pumpkin but I had a beautiful fresh one so I cooked it up? Thanks for stopping by! I just want to say how much this whole post delights me. I, too, have an incredibly silly and wonderful golden retriever who just loves to lay right on top of me when I am trying to sleep in. Gracie also loves getting all of my stray crumbs. Oooooo…….I need to make that right now. Your photo is glowing! Is it any good without the glaze? My significant other doesn’t like glaze. It’s perfectly delicious without the glaze.